When I think of balance, I automatically think of a scale. A large, cumbersome scale with weights. I picture how the scale starts off with one side higher than the other – weights are added or removed – until balance between the sides is reached. The front and left side of our body is considered Female. Female qualities are dark, cool, damp, internal and negative. Male qualities are light, warm, dry, external and positive. In Traditional Chinese Medicine each of the 5 elements – Fire, Earth, Metal, Water and Wood – consist of a Male and Female meridian. 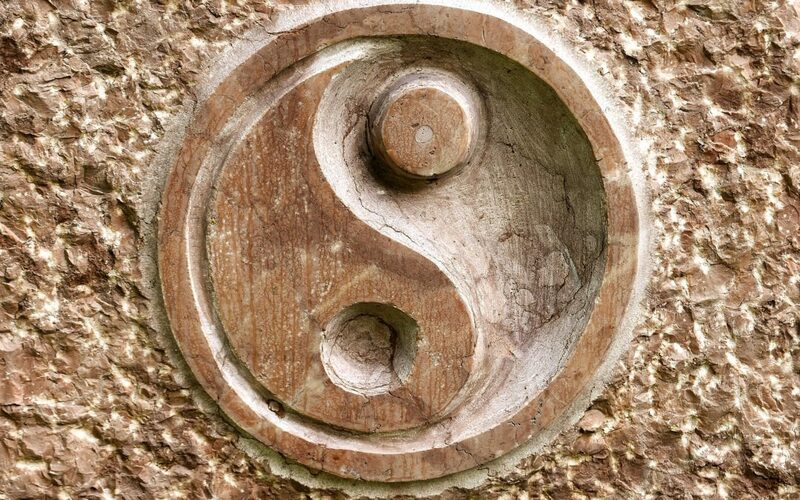 The Yin or Female meridians work continuously – heart, pericardium, spleen, lung, kidney and liver. The Yang or Male meridians work sporadically – small intestine, triple warmer, stomach, large intestine, bladder, gallbladder. And then there is Chakra theory. I learned that the 2,4,6 Chakras spin in a clockwise direction when in balance for Females and in a counterclockwise direction when in balance for Males and visa versa for Chakras 1,3,5 and 7. 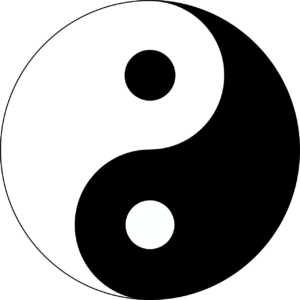 Balance is such an interesting concept as it not only means embracing qualities that are opposite – contradictory – paradoxical – but, embracing these disharmonious qualities in equal proportions to achieve a state of perfection – balance. Consider the truth of these popular paradoxical quotes…..
With respect to balance, I can only say, there is no black or white. There is only black and white – negative and positive – female and male – in equally opposing proportions.